If you love gardening you probably also like to decorate your garden space. I know I do. And sometimes when I plant seeds I don’t remember what I planted in that particular spot. Below are 10 DIY garden makers created by other garden lovers. Click on the link below each photo to go to the source and instructions, though they’re fairly self-explanatory. 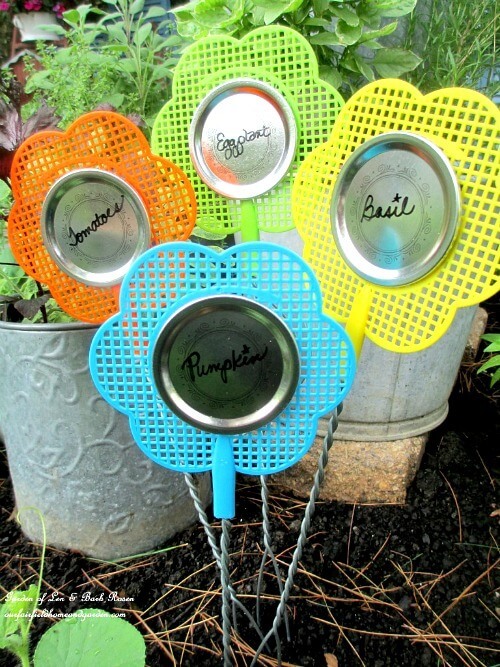 Old fashioned fly swatters. Oh, I do recall them from my youth. Here they are a colorful background for plant markers. 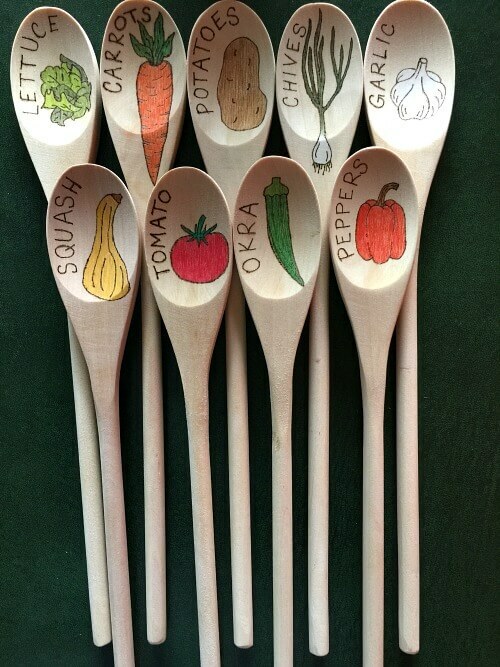 Wooden spoons are pretty cheap and easy to come by. I used wooden spoons to decorate my kitchen cabinets. I probably have a few left. I may have to create plant markers with the rest. 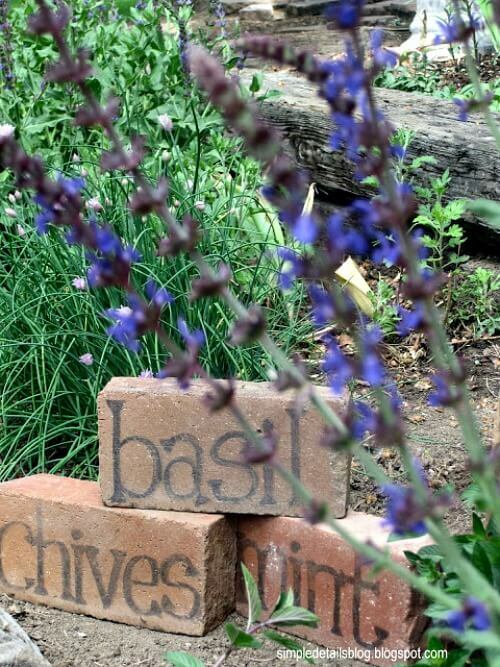 Do you have any old bricks laying around your yard or garage? 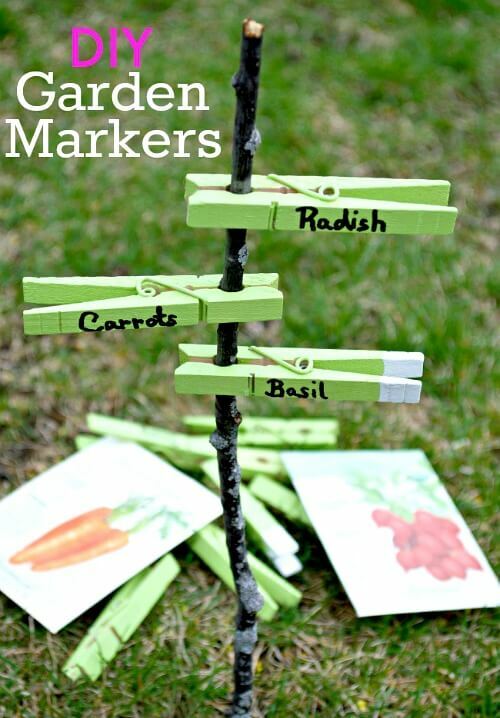 Use them to make quick and easy plant markers. You can find little unpainted wooden spools at your craft store. I have some myself around here somewhere. 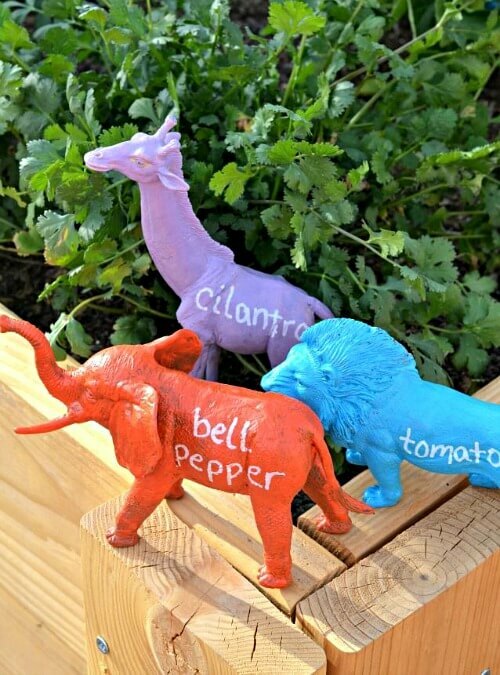 They make cute and easy plant markers. You can go to your paint store and get these paint sticks free of charge. Then paint and decorate as you please and stick in the ground. Wine corks are a nice textured element to add to your garden. 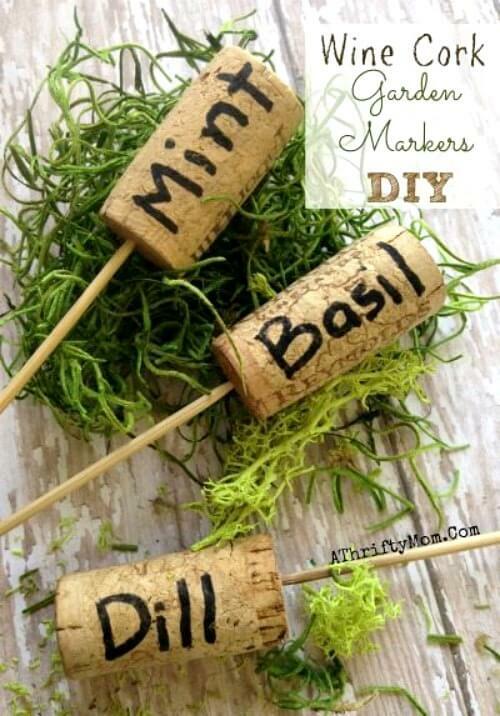 Put a stick in the cork and you’ve got a garden marker. 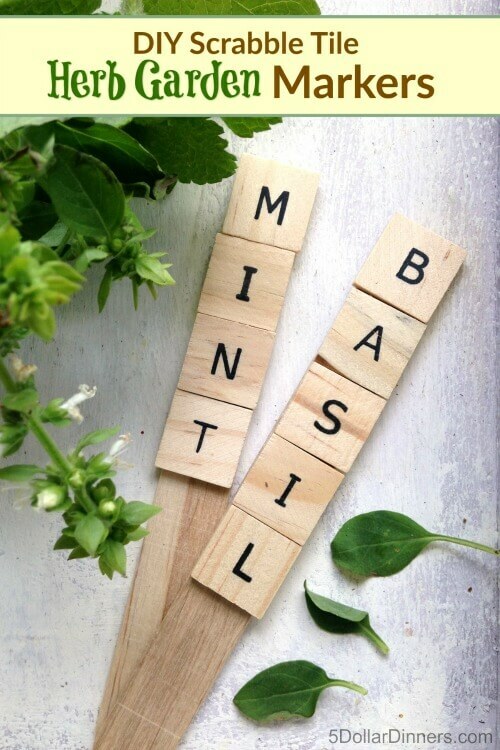 Scrabble tiles make nice plant markers too. Buy the tiles or make your own from plywood. Then just label them. 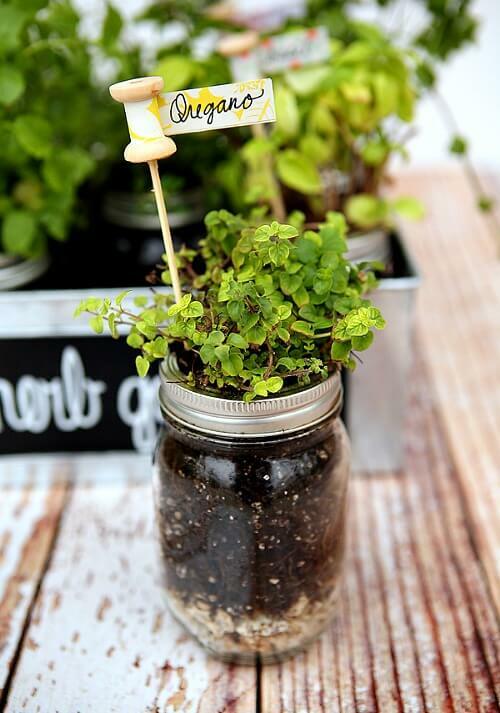 You could stamp the lettering on or simply write the name of the plants yourself. 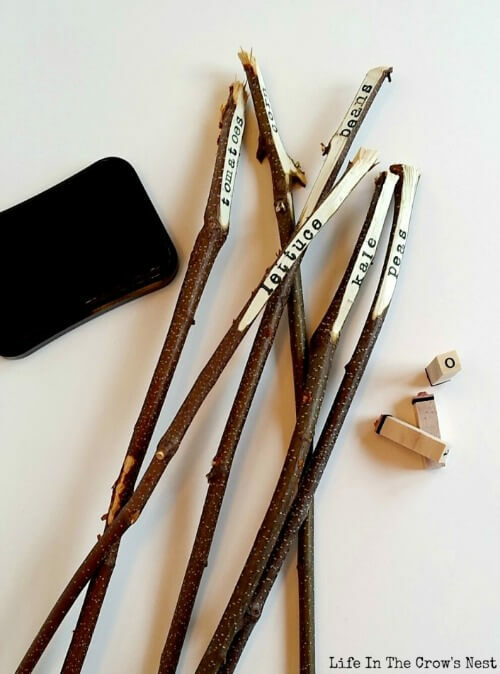 It doesn’t get much easier than clothespins clipped to a stick. Paint if you so desire or leave plain. 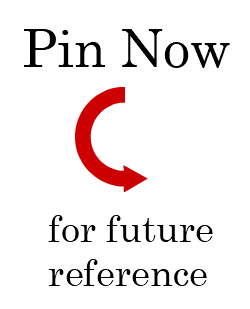 Then write the plant’s name on the side of the clothespin. If you have kids (or grand kids) then you probably have plastic toy animals. The kids would love to join in for this craft. Sticks are probably laying around your yard. Cut to the desired length. Strip back some of the bark and write down the name of the plant. Quick and simple. These kinds of DIYs are what we gardeners love to do when it’s raining and we can’t be outside in the garden. This would also be a fun party idea. 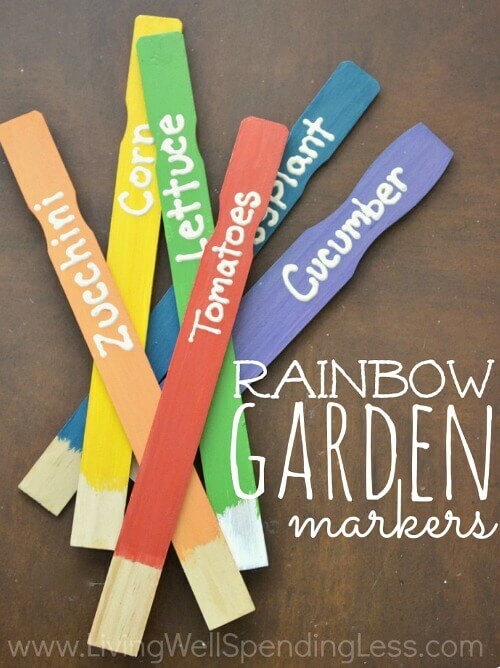 Invite neighbors or friends over and enjoy an afternoon making plant markers. I would advise using materials and supplies that are outdoor friendly for these crafts. You don’t have to spend a lot of money to make plant markers to identify your plants. And it can be a fun endeavor as well. I may just have to drop by the dollar store to see what I can come up with. I love that last one but there’s no way I’d have the time or patience for that!!! Really fun ideas, I love them all!! Have a blessed Easter. These are so cute and clever. I do love my red wine and you betcha I will be saving the corks! And the spoons, the paint sticks, and the bricks (we have so many old bricks stacked in the shed and I have a drawer full of the paint sticks) are as simple and frugal as can be. I need to get busy — it is planting time here! My arugula looks really good and my tomato seedlings now have their second set of leaves — should’ve planted the tomato seeds earlier. So much to do; so much fun to be had. Thank you for sharing. Thank you for these clever ideas! You have such interesting and creative tips to pass on to us.